CP24 News – September 16, 2018. Weekend events recap featuring Toronto Garlic Festival. Marilyn Denis Show – October 25, 2017. Nutritionist Miranda Malisani’s visit to Toronto Garlic Festival. CP24 Breakfast – September 16, 2017. Festival founder Peter McClusky serves up Garlic Sake Ice Cream. CP24 Breakfast – September 18, 2016 (8:20am). Featuring festival vendors Drake General Store and Bespoke Butcher. Nossa TV Canada – Oct 14, 2015. Garlic Festival 2015. Global Morning Show – September 18, 2015. Lisa Sanguedolce of Le Dolci and Festival Founder Peter McClusky in live garlic pastry tasting with host Carlyn Mackenzie in 8:50am segment. CHEX TELEVISION – August 21, 2015. On-air interview with Festival Founder Peter McClusky (starts @ 33:35). Rogers Channel 105 – October 1, 2014. Legislative Assembly of Ontario, Official Report of Debates. (Hansard) Minister of Tourism Culture and Sport on the Toronto Garlic Festival (excerpt from transcript). CP24 Breakfast Television – September 21, 2014 (8:20 AM). Features Toronto Garlic Festival partners Ted English (The Chocolateria), Chef Anne Sorrenti, and the Ontario Science Centre. CHIN TV/CITY TV – The Johnny Lombardi Show. September 21, 2014 (11:00 AM). Festival chef Giacomo Pasquini demonstrates Home Made Garlic Ciabatta Bruschettone, with a traditional Porchetta with “agliata”( garlic confit and Parsley). Deconstructing Dinner – September 23 , 2013. Garlic Episode. Toronto Garlic Festival featured at 11:20 – 12:33. CHIN TV – September 22, 2013. Toronto Garlic Festival chef Anne Sorrenti makes gluten free black garlic chocolate brownies. Global TV News – September 22, 2013.Global TV Coverage Sept22-2014. CBC Toronto – August 7, 2013. Festival founder Peter McClusky featured in segment on garlic and cancer (24:20-26:23). Breakfast Television – April 19, 2013. The Chocolateria features their Tanzanian Dark Chocolate Truffle with fermented garlic, specially made for the Toronto Garlic Festival table at the 2013 Brewers Plate (54:00). CHCH Morning Live – April 16, 2013. 8:50 AM. Brewers Plate Toronto, interview with Peter McClusky from Toronto Garlic Festival. CBC Marketplace with Tom Harrington – October 26, 2012. 8 PM EST. “High Steaks.” Tom Harrington does a steak cooking demo at the Toronto Garlic Festival. Daytime Rogers TV – October 12, 2012. Interview with Peter McClusky and chef Anne Sorrenti. CBC Here and Now – October 10, 2018. Food columnist Emma Waverman on garlic season. Newstalk 1010 – September 15, 2018. Toronto Garlic Festival. Newstalk 1010 – September 9, 2017. Let’s Eat with Zane Caplansky. Radio Canada – September 16, 2016. Les Bouchardises: le Festival de l’ail de Toronto. Newstalk 1010 – The Pay Chen Show – September 10, 2016. Live interview with Peter McClusky. Newstalk 1010 – Saturdays with Ted Woloshyn – Sept 3, 2016. Live interview with Toronto Garlic Festival founder Peter McClusky, festival vendors Ilyan Balicki (Chocosol Traders) and Spencer Idenouye (Capture Scratch) (1:42:09 to 2:01:45). Ryerson Radio – The Food Fix – June 1, 2016. Live interview with author and Toronto Garlic Festival founder Peter McClusky (0:59 to 16:45). NewsTalk 1010 – The Motts – September 20, 2015. Live interview with Toronto Garlic Festival Founder Peter McClusky. Bayshore Broadcasting News – September 18, 2015. Desboro farmers among several local producers at Toronto Garlic Festival. AM 740 AM – September 17, 2015. 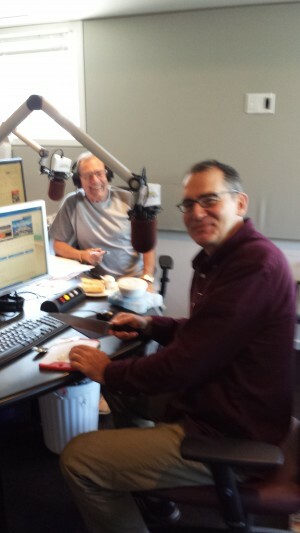 Festival founder Peter McClusky chops fresh garlic live on-air while making garlic bread for host Frank Proctor. The New Classical 96.3 FM – September 17, 2015. Host Bill Andersen interviews Festival Founder Peter McClusky while sampling Butterscotch Ice Cream with Black Garlic & Bourbon swirl. SiriusXM Ward & Al Show – September 1, 2015. Garlic talk in good humour and the book ‘Ontario Garlic’ with author Peter McClusky. CBC Morning North – August 21, 2015. Peter McClusky talks about the Sudbury Garlic Festival and the story of garlic in Ontario. CBC Fresh Air – June 14, 2015. Toronto Garlic Festival founder Peter McClusky talks about his new book, Ontario Garlic: The Story From Farm to Festival. Saturdays with Ted Woloshyn – September 20, 2014. Ted talks with festival founder Peter McClusky and Chef Ron Raymer. AM 530 Multicultural Radio. September 20, 2014. Ted Waloshyn interviews Toronto Garlic Festival vendor and farmer Alana Kramarchuk. CBC Here and Now – September 19, 2014. Toronto Garlic Festival founder Peter McClusky talks about Ontario garlic. SIRIUS XM – Ward & Al. September 17, 2014. Al and Arthur (filling in for Al) talk with festival founder Peter McClusky about Ontario garlic. The Pay Chen Show, Newstalk 1010 – September 7, 2014. Festival founder Peter McClusky talks about the Toronto Garlic Festival and his 2015 book, Ontario Garlic: The Story from Farm to Festival. CBC Metro Morning with Matt Galloway – September 20, 2013. Festival founder Peter McClusky describes his transition to growing garlic. CHOQ FM – September 19, 2013. Interview with Toronto Garlic Festival chef Veronique Perez from Limonana. CBC Here and Now – October 12, 2012. Interview with Peter McClusky. Newstalk 1010 – October 6, 2012. 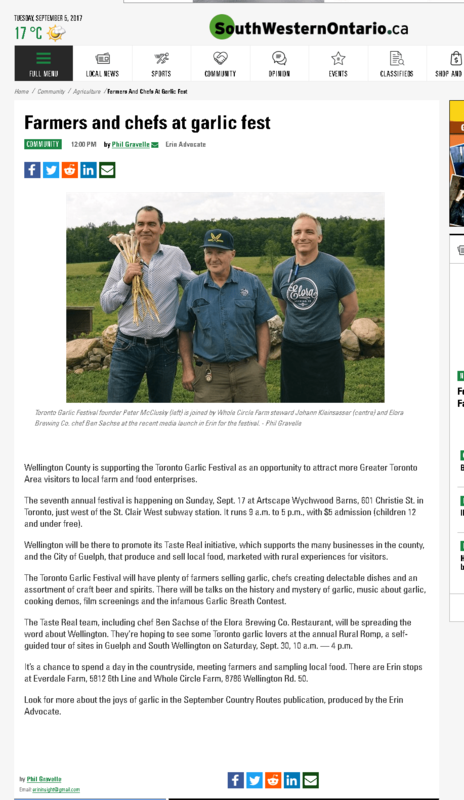 Ted Woloshyn & The Toronto Garlic Festival. Edible Toronto – September, 2018.When Chocolate Meets Garlic. The Garlic News – Issue 54 Winter 2017-2018, pg 8. A very successful 7th annual Toronto Garlic Festival. Globe and Mail – October 4, 2017. How to choose a bottle of wine that suits a variety of Thanksgiving dishes – including turkey. snapd Annex/Yorkville – October, 2017. Toronto Garlic Festival 2017. Grand Magazine – September/October, 2017. ‘Unparalleled’ Aroma. Small Farm Canada – September/October, 2017. A pungent resurgence. National Post– September 7, 2017. Growing garlic is often a labour of love, but entirely worthwhile. Mercury News (California) – July 26, 2017. Gilroy Garlic Festival 2017: Your guide to good eats, Giada’s appearance. Bancroft this Week – July 20, 2017. Maynooth to host own garlic festival. Канадската български вестници/Bulgarian Horizons Newspaper. February 27, 2017. Peter McClusky – от името на дядо Мечкарски, кани на 7-ми Чесънът фестивал в Торонто. ot imeto na dyado Mechkarski, kani na 7-mi Chesŭnŭt festival v Toronto. Hon. Carolyn Bennett, Member of Parliament, Toronto-St. Paul’s – Winter 2017. Parliamentary Report. Ontario Farmer – November 8, 2016. Ontario Garlic Gaining Acceptance. Toronto Star – September 14, 2016. Garlic Man’s Clove Legacy is Legendary. Toronto Sun – September 14, 2016. Toronto Garlic Festival is Back! Guelph Mercury Tribune – September 8, 2016. Going Beyond Savoury Dishes with Garlic. Forever Young – August, 2016. Garfests of Ontario. Harrowsmith – March, 2016. How Garlic Got It’s Groove Back. Toronto Star – September 21, 2015. A Fresh Take on Bad Breath. Grey-Bruce This Week – September 17, 2015. Unique Synergy of Grey-Bruce farmers at Toronto Garlic Festival. Toronto Sun – September 15, 2015. Plenty of food festivals to sink your teeth into. The Epoch Times – September 10-16, 2015. A Tribute to Garlic: New book full of wit, lessons and historical facts. Frontenac News- September 9, 2015. Fresh take on the history of Ontario Garlic. TorontoSUN.com – September 05, 2015. Festivals celebrating garlic held across Canada. Calgary Sun – September 5, 2015. Festivals Celebrating Garlic Held Across Canada. Vitality Magazine- September, 2015. Community News: Toronto Garlic Festival. Blackburn News – August 7, 2015. Marketing Bruce Garlic in Toronto. Legislative Assembly of Ontario Report of Debates (Hansard) – October 4, 2014. Comments by Minister Michael Coteau. Toronto Star – September 25, 2014. Toronto Star Teacher of the Year: Keith Hoare, Thistletown Collegiate: Using many ingredients to inspire his pupils. Russian Express / Экспресс России – September 19, 2014. Как провести выходные. Post City Toronto – September 18, 2014. Weekend Warrior: Yogapalooza, Word on the Street, Toronto Garlic Festival, Manifesto. The Toronto Star – September 18, 2014. Celebrate Ontario Garlic at Weekend Festival. Toronto Sun – September 18, 2014. Garlic Takes Centre Stage at Annual Festival. The Toronto Star – September 17, 2014. Make every day a garlic festival: Fed. Inside Toronto – September 11, 2014. pg 3. It was either tulips or garlic for festival founder. The City Centre Mirror – September 11, 2014. Toronto Garlic Festival Set for Sept 21.
el Popular – September 10, 2014. Festival del ajo y otros cultivos llega a Toronto. Brantford Expositor – September 4, 2014. Gatepost Notes. Owen Sound Sun Times – September 2, 2014. Toronto Garlic Festival Gets a Taste of Bruce County. Monsoon Journal – September 2014. The Taste of Home: Garlic, and Other Great Ontario Crops, pg 44. Metro News – September 20, 2013. A picture of Toronto Garlic Festival chef Brook Kavanagh on page 4. NOW Toronto – September 19, 2013. Openings, closings, events and other news from T.O.’s food and drink scene. Post City Magazine – Sept 19, 2013. Weekend Warrior: Yogapalooza, Word on the Street, Toronto Garlic Festival, Manifesto. Toronto Sun – September 19, 2013. Third Annual Toronto Garlic Festival. Toronto Sun – September 18, 2013 – Cooking with garlic: A Canadian favourite. Brockville Recorded – September 18, 2013. Cooking with garlic: A Canadian favourite. Chatham Daily News – September 18, 2013. Cooking with garlic: A Canadian favourite. Cochrane Times – September 18, 2013. Cooking with garlic: A Canadian favourite. 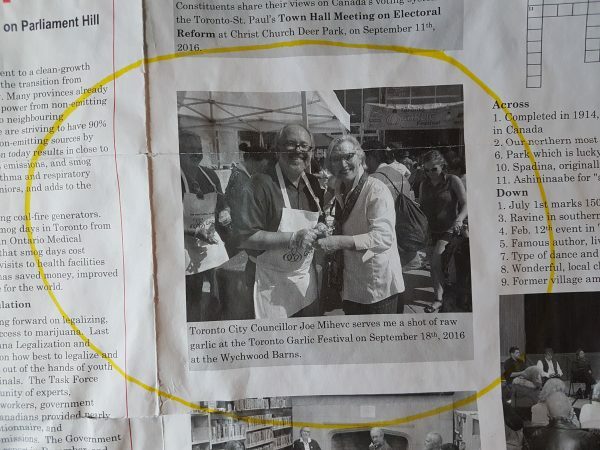 Fort Erie Times – September 18, 2013. Cooking with garlic: A Canadian favourite. Interlake Today – September 18, 2013. Cooking with garlic: A Canadian favourite. Melfort Journal – September 18, 2013. Cooking with garlic: A Canadian favourite. Owen Sound Times – September 18, 2013. Cooking with garlic: A Canadian favourite. Sarnia Observer – September 18, 2013. Cooking with garlic: A Canadian favourite. St. Thomas Times Journal – September 18, 2013. Cooking with garlic: A Canadian favourite. The Barrie Examiner – September 18, 2013. Cooking with garlic: A Canadian favourite. The Enterprise Bulletin – September 18, 2013. Cooking with garlic: A Canadian favourite. The Kingston Whig – September 18, 2013. Cooking with garlic: A Canadian favourite. National Post – September 9, 2013. Forks & The Road: Bring on the garlic festivals. Momentum Magazine – Issue 62, 2013. 1/2 page vertical Toronto Garlic Festival ad sponsored by Momentum Magazine. Village Living Magazine – August/September, 2013. Featured event listing. Ontario Culinary Tourism Alliance – 2013 Ontario Culinary Adventure Guide. Globe and Mail – October 31, 2012. “Three delicious recipes that pack a garlicky punch.“ by Lucy Waverman. Toronto Star – October 12, 2012. “How to grow big fat garlic cloves,“ by Sonia Day. National Post – October 11, 2012. “How T.O. appreciate garlic,“ by Sarah Lazarovic. Kyunghyang Post / 경향신문 – October 5, 2012. 한국인 경영의 삼사라농장 (Samsara Fields, Organic Farms). Interview with Toronto Garlic Festival farmer Soyoung Lee. Hatherleigh Press – 2012. Garlic: Farmstand Favorites: Over 75 Farm Fresh Recipes. Includes recipes from the Toronto Garlic Festival. Whole Health Kitchen – September 18, 2018. The Toronto Garlic Festival and Garlicy Kale Pesto (Vegan). Xinha News Agency – September 17, 2018. The 8th Annual Toronto Garlic Festival. Toronto.com – September 12, 2018. 12 Great Ways to Enjoy Fall in Toronto in 2018. Daily Hive – June 22, 2018. 76 amazing events and festivals in Toronto to check out this summer. Travelingmitch – December 11, 2017. Everything You Need to Know About the Toronto Garlic Festival. The Harvest Commission – September 15, 2017. Releasing the Garlic Flavour. Torontoist – September 15, 2017. Urban Planner: What’s on in Toronto. Toronto Life – Sept 11, 2017. What to do in Toronto this week. Guelphtoday.com – Sept 8, 2017. Wellington County is king of crops. SouthWesternOntario.ca – September 5, 2017. Farmers and chefs at garlic fest. Ontarioculinary.com – August 25, 2017. We’re All About the Allium at Toronto Garlic Festival. Sudbury.com – August 25, 2017. Garlic Recipes, Local beans, and Sudbury Guitar Trio – This Week at The Market. Huffingtonpost.ca – May 25, 2017. The Ultimate Toronto Food Fest 2017 Guide. Standardmedia.co – March 7, 2017. The healing power of garlic and types of cancer it can prevent you from. Gardenmaking.com – September 18, 2016. Toronto Garlic Festival. Latestcanada.com – September 18, 2016. Toronto Garlic Festival Adds Some Kick to the Weekend. Myinforms.com – September 18, 2016. Toronto Garlic Festival Adds Some Kick to the Weekend. Thestar.com – September 18, 2016. Toronto Garlic Festival Adds Some Kick to the Weekend. OntarioNews – September 18, 2016. Toronto Garlic Festival Adds Some Kick to the Weekend. newssaskatchewa.ca– September 18, 2016. Toronto Garlic Festival Adds Some Kick to the Weekend. Thespec.com – September 17, 2016. Wait until mid-October to plant garlic. Goodfoodrevolution.com – September 16, 2016. Toronto Garlic Fest 2016. Radio-Canada.ca – September 16, 2016. Les Bouchardises : le Festival de l’ail de Toronto. Foodism.to – September 14, 2016. Garlic, Spice and All Things Nice. InsideToronto.com – September 8, 2016. Recipes: Going Beyond Savoury Dishes with Garlic. ILoveToronto.com – August 30, 2016. Toronto’s Top September Events. InsideToronto.com – August 19, 2016. Toronto Garlic Festival celebrating six stinkin’ years. The Long and Short of It – September 28, 2015. Toronto Garlic Festival 2015…A Stinky Success! Lewed’s Blog czyli Dziennik Szlachcica Polskiego – September 21, 2015. Garlic is the Celebrity. The Toronto Star – September 21, 2015. Garlic lovers indulge their passion at Wychwood Barns festival. SeniorToronto.ca – September 18, 2015. Toronto Garlic Festival. InsideToronto.com – September 16, 2015. Enjoy jams, jellies and even butter tarts with garlic at Toronto Garlic Festival. The Hip & Urban Girl – September 12, 2015. The Toronto Garlic Festival! Thestar.com – September 09, 2015. Food & Wine Events. PressReader.com – September 09, 2015. Garlic festival reveals tart bulb’s unexpected sweet side. TheProvince.com – September 08, 2015. Pungency Promised at festivals celebrating garlic held across Canada. NationalPost.com – September 08, 2015. Pungency Promised at festivals celebrating garlic held across Canada. LFPress.com – September 05, 2015. Festivals celebrating garlic held across Canada. 620CKRM.com – September 05, 2015. Celebrating “garlic” across Canada. Vancouver Sun – September 4, 2015. Garlic grower and author Peter McClusky works in his garlic patch. CTVNews.ca – September 04, 2015. Pungency Promised at festivals celebrating garlic held across Canada. blogTO.com – August 28, 2015. Toronto Food Events: AwesTRUCK, Food Truck Frenzy, Tamil Festival, Le Burger Week, Toronto Garlic Festival. ChooseCornwall.ca – August 28, 2015. Garlic Festival Adds Flavour to Lamoureux Park. BlackburnNews.com – August 07, 2015. Marketing Bruce Garlic in Toronto. TheGate.ca – June 27, 2015. 5th Anniversary Toronto Garlic Festival. Diggin The Dirt – October 8, 2014. Toronto’s Garlic Festival. Get Out – October 8, 2014. Taking It Raw At The Toronto Garlic Festival. eve Woman’s World – October 1, 2014. The immense medicinal value of garlic. CanCulture – September 28, 2014. I put that stuff on everything! – Toronto’s Garlic Festival 2014. Fables and Focacciao – September 22, 2014. A Bulbous Bash: The Toronto Garlic Festival. Vegiterra – September 22, 2014. Vegiterra at Toronto Garlic Festival. Mom Who Runs – September 22, 2014. The Toronto Garlic Festival is Garlicky Good. Dan Schaumann – September 21, 2014. Garliced out at the Toronto Garlic Festival. Ciao Down with Mama Theresa – September 20, 2014. Toronto Garlic Festival 2014. NOW Toronto – September 19, 2014. https://nowtoronto.com/search/event/all/. Blog TO – September 19, 2014. Toronto Food Events: Food Truck Fest, Garlic Fest, Madcap Pickle Championship, The Pig & The Pasta. CBC News – September 19, 2014. What’s on in Toronto this weekend. Grey-Bruce This Week – September 2, 2014. Toronto Garlic Festival gets a Taste of Bruce County. Montreal Gazette – May 22, 2014. Food chat recap: Glorious Garlic. Special guest Peter McClusky. Greenbelt Fresh – April 11, 2014. An Interview with Peter McClusky on Tracing Garlic’s Ontario Roots. Food Link Grey Bruce – August 20, 2014. http://www.goodfoodrevolution.com/fresh-garlic-ontario/. Huffington Post – September 25, 2013. How to Get Local Garlic in Your Supermarket. Huffington Post – September 25, 2013. Benefits of Garlic: 11 Healthy Reasons To Eat More Of This Smelly Superfood. The Kitchen Operas – September 24, 2013. Roasted Walnut & Garlic Hummus. The Sydney Chronicles – September 23, 2013. fall/weekend. Torontoist – September 23, 2013. Garlic Unites a Crowd at the Brick Works. Mom Who Runs – September 22, 2013. Toronto Garlic Festival and More Upcoming Events. BlogTO – September 20, 2013. Toronto Food Events: Awestruck Canada, Canada Brai Day, Sweets & Treats Fest, Garlic Fest, Foodival. Addicted – September 21, 2013. The Toronto Garlic Festival. SheDoesTheCity.com – September 17, 2013. In anticipation of the third annual Toronto Garlic Festival, we interview garlic farmer Heather MacMillan. Toronto Foodies – Upcoming Events. Everything Zoomer – September 20, 2013. The Man Behind The Toronto Garlic Festival. TheEyeopener.com – September 19, 2013. This Weekend in Toronto. VillageLivingMagazine.ca – September 19, 2013. 3rd Annual Toronto Garlic Festival – This Sunday September 22, 2013 | Evergreen Brickworks. Notable.ca – September 18, 2013. “Notable Reads: Toronto Garlic Festival chef Anne Sorrenti. Canadian Foodie Girl – September 15, 2013. Toronto Garlic Festival Craft Beer & Food Pairing. Travelandescape.com – August 14, 2013. How To Get Smelly: Ontario’s Garlic Festivals. Good Morning America – April 18, 2013. 8 Ridiculous Foods Made With Garlic. Torontoist.com – April 18, 2013. Brewer’s Plate Savours Ontario. Chef Anne Sorrenti at Toronto Garlic Festival’s chef table at Brewers Plate. Canadian Foodies – October 17, 2012. Brant County Garlic Company @ Toronto Garlic Festival 2012. Canadian Foodies – October 17, 2012. Busy Liz’s @ Toronto Garlic Festival 2012. Canadian Foodies – October 17, 2012. Garlic Chocolate Ice Cream @ Toronto Garlic Festival 2012. Canadian Foodies – October 17, 2012. Garlic Growers Association of Ontario @ Toronto Garlic Festival 2012. Canadian Foodies – October 17, 2012. Golden Acres Farm @ Toronto Garlic Festival 2012. Canadian Foodies – October 17, 2012. Incredible Spice @ Toronto Garlic Festival 2012. Canadian Foodies – October 17, 2012. Incredible Spice’ Chutney Sells Out @ Toronto Garlic Festival 2012. Canadian Foodies – October 17, 2012. @ Toronto Garlic Festival 2012. Toronto Foodies – October 16, 2012. Toronto Garlic Festival. Canadian Foodies – October 14, 2012. AGreenCulture @ Toronto Garlic Festival 2012. Canadian Foodies – October 14, 2012. Alchemy Pickle Company @ Toronto Garlic Festival 2012. Canadian Foodies– October 14, 2012. Cheesewerks @ Toronto Garlic Festival 2012. Canadian Foodies – October 14, 2012. Peter McClusky @ Toronto Garlic Festival 2012. Canadian Foodies – October 14, 2012. This Little Pig @ Toronto Garlic Festival 2012. Canadian Foodies – October 14, 2012. Reiczas Rocamboles @ Toronto Garlic Festival 2012. Canadian Foodies – October 14, 2012. Simon De Boer @ Toronto Garlic Festival 2012. Canadian Foodies – October 14, 2012. Torito Tapas Bar @ Toronto Garlic Festival 2012. Canadian Foodies – October 13, 2012. Ken’s Garlic @ Toronto Garlic Festival 2012. Huffington Post – October 12, 2012. Garlic Benefits: 7 Things You May Not Know About Garlic. Peter Visima – October 13, 2012. Toronto Garlic Festival. Suhaag – October 12, 2012. “Garlic, the magical clove honoured at Toronto Festival.” Interview with festival speaker Dr Raji Iyer. Bits Lounge – October 10, 2012. Events. Canadian Foodies – February 10, 2012. Toronto Garlic Festival @ CSI Food Innovation Constellation.